The Liberal Democrats would not support any plan to cut public spending too early in the next Parliament, leader Nick Clegg has said. Deep cuts would be "economic masochism" so early in recovery, Mr Clegg said. In a hung parliament, the party with the "stronger mandate" had a "moral right to seek to govern", he added. Labour said it was pleased the Lib Dems agreed with its plan to delay cuts. The Conservatives said senior Lib Dems were contradicting each other on cuts. In his speech to the spring conference on Saturday, Lib Dem Treasury spokesman Vince Cable accused Labour and the Conservatives of engaging in a "phoney war over cuts weeks before an election that will affect the lives of millions of people". The government was trying to present itself as "the party of spending and public investment", at the same time as public sector workers were losing their jobs, he said. The Conservatives' spending plans were not yet known, he said, adding: "I think the present line on the budget is: Trust us and we'll tell you after the election." He added: "That simply isn't good enough." Prime Minister Gordon Brown and Conservative leader David Cameron have argued repeatedly about the level and timing of public spending cuts required to deal with record government debt. The Tories have insisted that efforts to begin reducing the deficit must start immediately, while Labour says it wants to wait until the recovery is secure. Mr Clegg has found himself facing questions about what his party - the UK's third biggest - will do in the event of a hung parliament after the general election - widely expected to be held on 6 May. He was asked on Today whether his party would support a minority Conservative or Labour government in the event of a hung parliament. He said his party had identified £15bn worth of reductions in public spending to help reduce the deficit. But he said cutting too early would risk "pulling out the carpet from under the feet" of the British economy, which he said was still "too fragile". He added: "We think that merrily slashing now is an act of economic masochism. "If anyone had to rely on our support, and we were involved in government, of course we would say no." 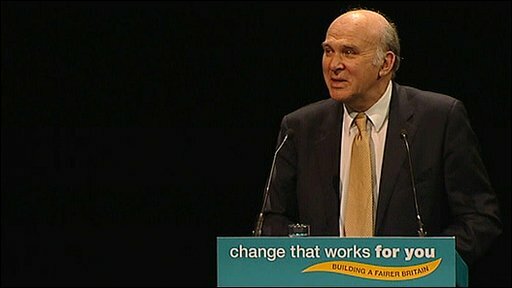 His party, he said, would urge ministers to "do it sensibly, do what myself and Vince Cable and others have been arguing for some time now, which is explain to the British people - and indeed to the financial markets - that we have a better plan than anybody else to fill the black hole that Gordon Brown has created, but do it at a time when it is economically sustainable." 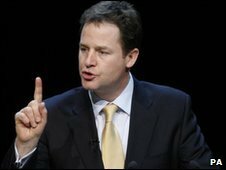 Mr Clegg repeated what he said were the Lib Dems' bottom-line demands for supporting any minority administration: reforming of the tax system, more spending on education for poorer children, a switch to a greener economy and political reform in Westminster. In his speech, Mr Cable reminded activists of planned savings including: limiting public sector pay rises and stopping all bonuses for two years; ending government contributions to the Child Trust Fund; cutting tax credits for high earners; not replacing Trident; scrapping ID cards. A Liberal Democrat government would conduct an urgent public spending review, with proposed cuts then debated publicly, he added. "It's right and fair that the people who are going to be affected by these changes get to have their say," Mr Cable said. BBC political correspondent Mike Sergeant, at the conference in Birmingham, said: "We thought we would be getting some more detail on some new announcements of possible spending cuts. "That isn't going to happen this weekend - Nick Clegg, the party leader, saying that would probably take place in the next few weeks, we will get that kind of detail. "I don't think the Liberal Democrats wanted this weekend to be all about spending cuts - they want to emphasise some of their other, positive messages for the upcoming campaign." A Labour Party spokesman said: "I am pleased that Vince Cable agrees with us that cutting support for the economy now would be a huge mistake, choking off recovery. "Once again the Tories are isolated. Their plans for deep, immediate cuts would be disastrous for British families and businesses." The Conservative Party claims many Lib Dem policies and spending commitments are uncosted and would lead to a multi-billion pound deficit increase. Philip Hammond, the Tory shadow chief secretary to the Treasury, said: "The Lib Dems are all over the place on this, I'm afraid. "A couple of days ago Nick Clegg was talking about the need for a repayment of the debt to reassure the financial markets. "Some of them are talking about ring-fencing areas of public spending; Vince Cable himself has said there should be no ring-fencing." He said that the Conservatives had been very clear that they would make a "measured start" this year to cutting the deficit. The cuts would be "part of a credible plan, spread out over the lifetime of a Parliament, to get the public finances back in good shape so that they can support the recovery of the economy and the creation of the jobs and investment that we need in this country", he told BBC News. Mr Clegg will make his keynote speech at the conference on Sunday. Danny Alexander, Mr Clegg's chief of staff who has been writing the party's election manifesto, said it would be "short, direct and to the point". On Friday, the party announced their campaign slogan as: "Change that works for you. Building a fairer Britain" - combining the themes of Labour and the Conservatives' own messages. Labour's election slogan is "a future fair for all" while the Tories have said 2010 will be a "year for change".